The NDA in Bihar, comprising the BJP, Chief Minister Nitish Kumar’s JD(U) and Ram Vilas Paswan’s LJP, Saturday announced its candidates for 39 out of the total 40 Lok Sabha seats in the State. As per the names announced at a press meet here by BJP national general secretary and party in-charge for the state Bhupendra Yadav, Union minister Ravi Shankar Prasad will be contesting from Patna Sahib seat — a party stronghold represented by Shatrughan Sinha in the outgoing Lok Sabha. According to media reports, Mr. Sinha is likely to join the Congress and seek re-election on a ticket of the grand old party. Ravi Shankar Prasad replaces Shatrughan Sinha in Patnasahib. While Union minister Giriraj Singh, whose Nawada seat has gone to the LJP, has been shifted to Begusarai, his colleagues in the council of ministers Radha Mohan Singh, R.K. Singh, Ashwani Kumar Choubey and Ram Kripal Yadav will be fielded from their respective sitting seats of Motihari, Ara, Buxar and Pataliputra. Lok Janshakti Party state president Pashupati Kumar Paras will be replacing his elder brother Ram Vilas Paswan in Hajipur. The Union minister is likely to get a Rajya Sabha ticket. Chirag Paswan will be seeking re-election from Jamui. Mr. Yadav also said the candidate for Khagaria Lok Sabha seat, which would be contested by the LJP, would be announced shortly. While Union minister Giriraj Singh, whose Nawada seat has gone to the LJP, has been shifted to Begusarai, his colleagues in the council of ministers Radha Mohan Singh, R.K. Singh, Ashwani Kumar Choubey and Ram Kripal Yadav will be fielded from their respective sitting seats of Motihari, Ara, Buxar and Pataliputra. Lok Janshakti Party state president Pashupati Kumar Paras will be replacing his elder brother Ram Vilas Paswan in Hajipur. The Union minister is likely to get a Rajya Sabha ticket. Chirag Paswan will be seeking re-election from Jamui. Mr. Yadav also said the candidate for Khagaria Lok Sabha seat, which would be contested by the LJP, would be announced shortly. He was addressing the NDA’s sankalp rally at the Gandhi Maidan in Patna. “We are proud of our armed forces, but some people in our country are making statements which have brought smiles on our enemy’s faces,” he said. “But, your chowkidar is standing rock solid before them for the security of the country and protecting the interests of the poor people,” he said. Leaders of the BJP, JD(U) and Lok Janshakti Party were present on the dias along with the Prime Minister. Mr. Modi said, “For the first time in 50 years, India was recently invited to the Islamic countries conference,” and “its voice was heard with respect. “The Crown Prince of Saudi Arabia too had come here and he increased the quota of Haj pilgrims to 2 lakh for Indian Muslims on my request. He also declared the release of 850 Indian prisoners arrested in his country on flimsy charges,” he said. “This reflects another example of our respect in world community, but it also reflects what Congress was doing when it ruled the country,” he added further. While slamming the Opposition parties for coming together to contest him, Mr. Modi said, “My priority is to appeal people to come to end terrorism but they say come to finish Modi; I say come to end poverty, corruption, black money, malnutrition, unemployment and fight for cleanliness but they [Opposition] are cobbling together to fight Modi,” he said. “But the people of the country have decided to punish them once again,” he added. “Every year, ₹75,000 crore will be given directly to the bank accounts of farmers of the country,” Mr. Modi said, addressing the issue of farmers distress. He further listed several achievements of his government and programmes initiated for development in Bihar. He also thanked Bihar chief minister Nitish Kumar for “giving new direction to Bihar and taking it out from those dark days”. “Today Bihar has got a better atmosphere for business activity,” he said. Mr. Kumar thanked Mr. Modi for helping Bihar with several schemes and welfare measures. Mr. Kumar and Mr. Modi are sharing the dias after nine years. In 2010, they addressed an NDA rally together in Ludhiana, Punjab. The State NDA leaders claimed it as a “historic rally” in the political history of Bihar as over five lakh people were in attendance. The Lok Sabha on Friday witnessed sharp exchanges between Congress President Rahul Gandhi and Defence Minister Nirmala Sitharaman, who asserted: “Bofors took the Congress down but Rafale will bring Modi back”. In her reply to the debate on the Rafale deal, the minister sought to not only provide a point-by-point rebuttal to the Congress’s charges, but also initiated a counter attack. Charging the Congress of ignoring national security, she accused the UPA government of ‘stalling’ the Rafale deal because “it didn’t get money”. Ms. Sitharaman also informed the Lok Sabha that the draft report of the Comptroller and Auditor General (CAG) on all capital defence acquisitions, including the 36-aicraft Rafale deal, was with the Defence Ministry, which was preparing its responses to the CAG’s draft observations. She said even the basic price of the aircraft as negotiated by the UPA would have amounted to ₹737 crore at today’s rates as against the ₹670 crore at which the NDA government was buying the jets. The minister further claimed that the government had condensed the delivery time by five months; the first Rafale jet would be landing in the country in September and the last one would be delivered in 2022. Going on the offensive, the minister accused the Congress of misleading the country and claimed that there had been ‘no deal’ concluded during the UPA government’s term. The opposition party was shedding ‘crocodile tears’ for Hindustan Aeronautics Limited (HAL) and insulting Prime Minister Narendra Modi with a hug and a wink and by referring to her as a ‘liar’, Ms. Sitharaman said. She also said for every AA (a term coined by Mr Gandhi to call industrialist Anil Ambani), there was an RV (a reference to Sonia Gandhi’s son-in-law Robert Vadra ) and a ‘Q’ during Congress governments. An equally combative Mr. Gandhi hit back and said he didn’t blame Ms. Sitharaman or her predecessor, Manohar Parrikar, but only Mr. Modi, whom he accused of having committed a ‘bypass surgery’ of defence procurement procedures. Later, speaking to reporters outside Parliament House, Mr. Gandhi accused the Defence Minister of running away by not replying to specific questions raised by him and asserted that there would be a “criminal investigation into the Rafale deal once the government changes in 2019 elections”. Earlier during her reply, Ms. Sitharaman countered the Congress chief’s charge that the Prime Minister ‘unilaterally ordered’ 36 aircraft and claimed it was the Indian Air Force which suggested that the government buy two squadrons or 36 Rafale jets in ‘fly-away’ condition as against the UPA’s 18 planes. The minister said comparing the cost of ₹526 crore with ₹1,600 crore was like comparing apples to oranges. “Will the cost quoted in 2007 remain the same in 2016, because there is escalation cost and there is exchange rate variation,” she said. The minister also asserted that the government had given contracts worth ₹1 lakh crore to HAL. AIADMK leader and Deputy Speaker M. Thambidurai too sought to know why the government had allowed the offset contract to be given to the Anil Ambani-led Reliance group instead of HAL. Observing that the Anil Ambani group was selected as one of the offset partners by Rafale’s manufacturer Dassault Aviation, the Minister said the very same group had earlier obtained 53 waivers and concessions during the Congress-led UPA regime. An emotional Ms. Sitharaman also accused the Congress chief of “insulting people with humble backgrounds”. “Nobody has a right to call me or the prime minister a thief and a liar.. We all come from normal backgrounds…I come from a middle class. The Prime Minister comes from a humble background. The Prime Minister’s name is untarnished, he is not corrupt. I have my honour intact,” said a visibly angry Defence Minister. Allowed by the Speaker to seek a clarification to the Minister’s reply — uncommon for Lok Sabha proceedings — Mr. Gandhi reiterated that the former French President Francois Hollande had publicly stated that Anil Ambani’s name had been given to the French side by Mr. Modi. He also said that the current French President Emanuel Macron had told him that the price was not a secret. “When the Prime Minister had done a bypass surgery [of the earlier deal] did the officials object to it or not? Can you reply with a Yes or No?,” Mr. Gandhi asked. Days after quitting the National Democratic Alliance (NDA), the Rashtriya Lok Samta Party, led by former Union Minister Upendra Kushwaha, on December 20 joined the United Progressive Alliance (UPA). The announcement of the party joining the alliance of Opposition parties in Bihar to counter the NDA that comprises the BJP, the Janata Dal(U) and the Lok Jan Shakti Party, was made at a press conference at the All India Congress Committee (AICC) headquarters in New Delhi. The announcement was made at a press conference at the Congress headquarters in New Delhi. Senior Congress leader Ahmed Patel, AICC Bihar in charge Shaktisinh Gohil, Rashtriya Janata Dal leader Tejashwi Yadav and Loktantrik Janata Dal leader Sharad Yadav were present. The UPA in Bihar comprised the Congress, the RJD and the former Bihar Chief Minister Jitan Ram Manjhi-led Hindustani Awam Morcha (Secular). The former Union minister joined the United Progressive Alliance (UPA) after holding talks with the Congress leadership. The Congress, Rashtriya Janata Dal, former Bihar Chief Minister Jitan Ram Manjhi-led Hindustani Awam Morcha (Secular) are already part of the UPA in Bihar and are seeking to give a fight to the National Democratic Alliance (NDA) in the upcoming Lok Sabha polls. The saffron alliance had swept the Lok Sabha elections in 2014, winning 31 of the state’s 40 seats. Kushwaha’s joining the UPA is likely to give a boost to the formation of a grand alliance in Bihar to counter the NDA combine of Bharatiya Janata Party-Janata Dal(U)-Lok Janshakti Party. 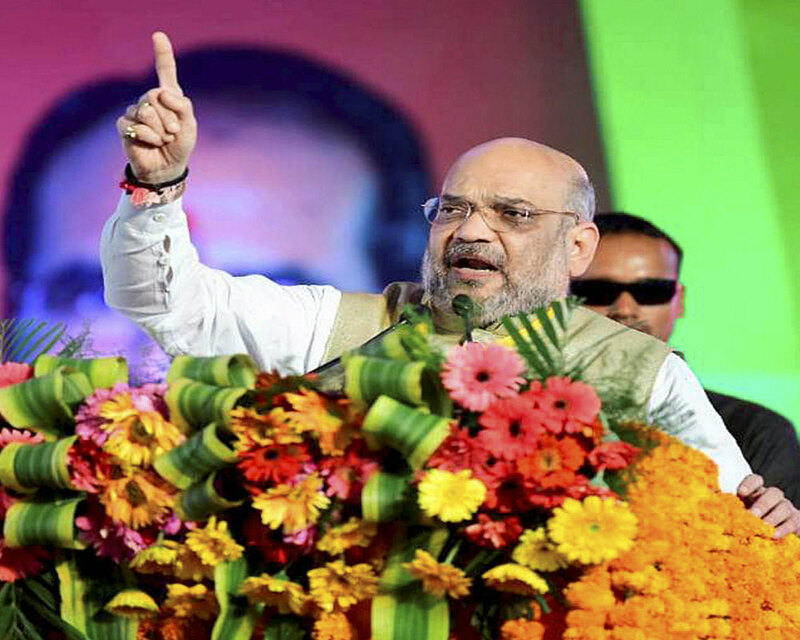 The BJP and JD(U) will contest an equal number of seats in the 2019 Lok Sabha elections in Bihar, BJP president Amit Shah said Friday. Other NDA allies, including the LJP and the RLSP, will get due representation in the seat sharing formula, Shah said. Addressing reporters along with Bihar Chief Minister and JD(U) leader Nitish Kumar, he said the number of seats each ally will get will be announced in the next three-four days. Lok Janshakti Party chief Ram Vilas Paswan and Rashtriya Lok Samta Party (RLSP) leader Upendra Khushwaha are firmly with the NDA and their parties will get due representation in seat sharing, the BJP chief said. Addressing reporters along with Bihar Chief Minister and JD(U) leader Nitish Kumar, he said the number of seats each ally will get will be announced in the next three-four days. Lok Janshakti Party chief Ram Vilas Paswan and Rashtriya Lok Samta Party (RLSP) leader Upendra Khushwaha are firmly with the NDA and their parties will get due representation in seat sharing, the BJP chief said. The BJP and JD(U) will contest an equal number of seats in the 2019 Lok Sabha elections in Bihar, BJP president Amit Shah said. Other NDA allies, including the LJP and the RLSP, will get due representation in the seat sharing formula, Shah said. Addressing reporters along with Bihar Chief Minister and JD(U) leader Nitish Kumar, he said the number of seats each ally will get will be announced in the next three-four days. Lok Janshakti Party chief Ram Vilas Paswan and Rashtriya Lok Samta Party (RLSP) leader Upendra Khushwaha are firmly with the NDA and their parties will get due representation in seat sharing, the BJP chief said. Finance Minister Arun Jaitley on Sunday said former French President Francois Hollande contradicted his own statement with regard to the Rafale deal and that neither the Indian nor the French government played any role in selection of Reliance as offset partner by Dassault. A political controversy has erupted over Hollande’s statement that the Indian government wanted the Anil Ambani-led Reliance Defence to be chosen as offset partner of Dassault, the manufacturer of the Rafale fighter jets. “The French Government and M/s Dassault Aviation have categorically denied the correctness of the former President’s first statement. “The French Government has stated that the decision with regard to the offset contracts of Dassault Aviation are taken by the company and not the Government,” Mr. Jaitley said in a Facebook post. “Dassault Aviation itself has suggested that they have entered into multiple contracts with several public sector and private sector companies with regard to the offset contracts and the decision is entirely theirs,” he added. “This contradicts his first questionable statement which the French Government and Dassault have denied. The facts contradict the same. His second statement in Montreal, Canada to AFP (news agency) makes the veracity of his first statement even more questionable,” the minister said. AFP reported that Hollande told it on the sidelines of a meeting in Canada Friday that France “did not choose Reliance in any way”. When asked whether India had put pressure on Reliance and Dassault to work together, Hollande said he was unaware and “only Dassault can comment on this”. A controversy is sought to be created on the basis of a statement made by the former French President Hollande, that the Reliance Defence ‘partnership’ with Dassault Aviation was entered at the suggestion of the Indian Government. In a subsequent statement the former President has sought to suggest that Reliance Defence emerged on the scene after the agreement with the Indian Government was entered into. He has, in a subsequent statement, said that he is ‘not aware’ if Government ever lobbied for Reliance Defence and that ‘the partners chose themselves’. Truth cannot have two versions. The French Government and M/s Dassault Aviation have categorically denied the correctness of the former President’s first statement. The French Government has stated that the decision with regard to the offset contracts of Dassault Aviation are taken by the company and not the Government. Dassault Aviation itself has suggested that they have entered into multiple contracts with several public sector and private sector companies with regard to the offset contracts and the decision is entirely theirs. Without commenting on the correctness or otherwise of a controversy in the French media, it may be mentioned that the former French President, Hollande, is countering statement made against him with regard to a conflict of interest in his dealing with the Reliance Defence. There is no ‘partnership’, as suggested by the former President, with regard to the 36 Rafale aircrafts to be supplied by Dassault Aviation to the Government of India. It was a Government to Government agreement under which the complete weaponised aircrafts are to come to the Indian Air Force. No manufacturing is to be done in India. It is, therefore, erroneous for anybody to suggest that there is a ‘partnership’ in the supply of the 36 Rafale aircrafts. M/s. Reliance Industries Ltd., in February, 2012, had entered into an MoU with Dassault Aviation. This was reported by the PTI on 12.2.2012. This was at a stage when the contract relating to 126 Rafale aircrafts, of which 18 were to be manufactured in France and 108 in India, was at an advance stage of consideration by the UPA Government. Rahul Gandhi’s misplaced criticism could equally apply to the 2012 MoU. The offset contract ensures investment by the original equipment supplier i.e. Dassault Aviation, in India, in as much as they make purchases from Indian companies to the extent of fifty percent (in this case). The choice of the offset partner under the 2005 offset policy is of M/s Dassault Aviation and they have selected several public and private sector companies to make the supplies. The offset partner is selected entirely by the Dassault Aviation, the original equipment manufacturer, and neither the French Government and nor the Indian Government has any say in the matter. The former French President’s first statement rhymes with Rahul Gandhi’s prediction. The Congress Party’s official handle on 31.8.2018 had carried the tweet of one of its leader “It is evident that Anil Ambani bribed President Hollande through his actor-partner to get the Dassault partnership.” For the Congress Party to allege that a former President had been bribed by an Indian business group and then use him as a primary witness, particularly when he is facing criticism for an alleged conflict of interest within his own country. The former French President’s first statement that the Indian business group’s name was proposed by Government of India has now been substituted by him to the effect that the suggestion he is ‘not aware’ of the Government of India ever lobbied for Reliance Defence. He further said that the ‘partners’ chose themselves (AFP Report dated 22.9.2018). Rahul Gandhi has made an absurd suggestion that the interest of Indian soldiers has been compromised with. By whom? The UPA which delayed the acquisition which would have added to the Military’s combat ability or the NDA which expedited the same at a lower cost. One Reliance Group was a part of this deal since 2012. It dropped out of defence production. The other Reliance Group was already in defence. They are not partners in the Rafale deal. They have no contract with either Government of India or Government of France. They were not selected as one of the many offset partners by any Government. ‘The partners (Dassault and Reliance) selected themselves’ as former President Hollande now says. This contradicts his first questionable statement which the French Government and Dassault have denied. The facts contradict the same. His second statement in Montreal, Canada to AFP makes the veracity of his first statement even more questionable. AIADMK, which was part of NDA during 1998-99 and 2004-06 is the third largest party in Lok Sabha after BJP and Congress. It has 50 members in both Houses of Parliament. Days after Nitish Kumar realigned with National Democratic Alliance, it has been reported that the AIADMK might become part of Modi-led NDA government soon. As per the media reports, senior party leaders of AIADMK would hold a meeting on August 04 to make a final decision and the major announcement is also expected in the first of this month. While talking to a leading portal, a senior Minister of the EPS government said, “Nothing is as such confirmed. We will discuss on Friday and decide. The proposal has been made (to us) but finally, it is the party’s call.” However, with this coalition, the ruling BJP is reportedly trying to increase its foothold in the Tamil Nadu, as it has only 2.5 per cent vote share in the state. Meanwhile, it has also been reported that BJP wants to rope in AIADMK to make NDA stronger ahead of 2019 general elections, which will be a great step towards victory. According to the reports, Prime Minister Narendra Modi and BJP chief Amit Shah have reportedly assigned the job of wooing AIADMK to a senior BJP functionary who holds a constitutional post. Union Finance Minister Arun Jaitley is attending a meeting of Empowered Committee of State Finance Ministers here on Tuesday to nudge the states to arrive at a consensus on the Goods and Services Tax (GST) Bill. Twenty-two states are represented at the meeting, which began in the morning, by their finance ministers. West Bengal Finance Minister Amit Mitra is chairing the closed-door meeting, said a state government official. Discussions on the draft Goods and Services Tax Bill, including the overall framework, and the Information Technology process of the GST are on the agenda of the two-day discussions, Mitra told IANS earlier. The meeting would also deliberate upon finding ways and means to resolve issues between the states and the Centre on the GST. However, the contentious issues of the GST rate, the dispute settlement mechanism and one per cent additional tax are not a part of the agenda. The meeting here follows West Bengal Chief Minister Mamata Banerjee’s declaration of support to the GST, which has come as a boost for the National Democratic Alliance (NDA) government’s efforts to get the bill passed in the Rajya Sabha in the monsoon session starting next month. The bill for a pan-India GST to thoroughly overhaul India’s indirect tax regime, first mooted by the Congress-led United Progressive Alliance regime at the Centre, has been passed by the Lok Sabha, but is stalled in the Rajya Sabha where the ruling NDA lacks a majority. The states will draft their own State GST (SGST) bill based on the draft model law with minor variations, incorporating state-specific exemptions. The Centre and the states will also have to approve the integrated GST law or iGST, which will deal with inter-state movement of goods. The Constitution amendment bill needs to be ratified by more than half of the states. India’s North East Region, which has been persistently neglected by Delhi in the past has received the much needed boost in the development of infrastructure, communication and in importance like never before under PM Modi’s ‘Act East Policy’ framework. Nevertheless, North East has been a part of the ‘Congress System’ for most of the post-independence period, but marred by false promises, unfinished public work and embezzlement of huge amount of public funds by its regional satraps under a decaying leadership, has largely contributed to the disillusionment of the NE people towards Delhi. But Modi government’s AEP has given top priority to the region and stressed the improvement of rail, road and water transport network to make it the ‘Gateway to South East Asia’ in the coming years. In the past two years, the NDA Government has spent more than rupees 10,000 crore in connecting the NE states to the rest of India which includes the introduction of ‘Rajdhani Express’ trains from New Delhi to Itanagar, the capital city of Arunachal Pradesh. Besides, the National Highways and Infrastructure Development Corporation for development of highways in the region is actively working to overhaul the road transport system so that it brings investment in industry and in infrastructure for generating employment to its youth. The PM has already announced heavy investment in power sector to provide 24X7X365 days of electricity along with a comprehensive telecommunication network which will enhance internet connectivity through an advanced I-way to the region. Indeed, the NE people has positively responded to the Central Government’s new schemes like Prime Minister’s Mudra Bank, Dhan Jan Yojana etc which reflects the ‘increasing association and attitudinal change’ in the region towards Delhi particularly after the installation of the NDA government at the centre. Modi’s AEP well augurs with his trademark slogan of ‘Sabke saath, sabka vikash’ both in terms of bringing together India’s grand mosaic of diverse people and regions. Finally, the recent opening of North East Democratic Alliance by the BJP to assuage the regional parties about its work ethic in terms of good governance and development to defeat negative propaganda of Congress to the steps taken under AEP would certainly forge the NE towards political rejuvenation and speedy economic development. On the day BJP-led NDA government completed two years in office, Prime Minister Narendra Modi said on Thursday that he would continue to serve 125 crore people of India. “Governments come and go. Elections happen. But a government is formed to serve the masses. In the two years, people have seen our work. I had said earlier that my government is dedicated to the poor of this country,” the PM added. “Our endeavour has been to strengthen state governments so that they too work for the welfare of the people. I have been a CM of a state and so I decided that Centre will have 35 percent in their treasury and the rest will be part of state coffers. We have brought many schemes for the poor,” he said. “The country is changing but the mindset of some of the people are not changing,” the PM pointed out. “We have given importance to building schools, hospitals, roads and transforming lives of the poor. We want to ensure that our sugarcane farmers do not face any problems. Government’s policy is that if sugar mills run honestly, no farmer would remain unpaid. I am warning the sugar mills, you won’t be allowed to do injustice to the farmers,” PM Modi said. “Merely throwing crumbs at farmers was is not our way of working. We are trying to solve the problems the farmers face,” he asserted. “Have you heard in the two years that Modi government indulged in corruption? Siphoned off money. Have you heard,” the PM asked the crowd. “In the present government road construction is double than that of the previous government. I have decided to link villages with roads. Its shameful – there were 18,000 villages where was not even an electricity pole,” he said. “The youth of this country must get jobs. The entire world says if there is a bright spot in the global economy, it is India,” he went on to say. “Two years back, there was an atmosphere of dejection in the country. Now there is a air of hope. We can progress only through development. Only development will take the country on the path of growth. I appeal to people to participate in this journey of development,” he said towards the end of his speech. PM Modi signed off with ‘Bharat Mata Ki Jai’.